Unless you've been deliberately ignoring climatologists, the weather, and, well, reality in general, you're aware that sea levels are rising at an increasing rate. 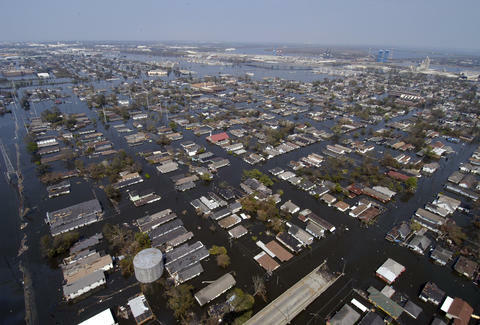 It's led to an uptick in devastating coastal flooding, since even a slight rise in water level can have a significant effect on the storm surge. The gloomy truth is that many coastal cities will likely find themselves underwater in the next hundred years. But here is some much-needed good news: An ingenious and innovative new infrastructure system is currently being developed that could provide a highly effective, wide-scale solution. The SAFE Building System, which stands for self-adjusting floating environment, would allow for entire communities to float up with the rising water, keeping them protected from floods. SAFE is being developed by Arx Pax, a company best known for designing the Hendo hoverboard -- a legitimate Back to the Future-esque levitating skateboard that showcased its "magnetic field architecture" technology. And while the SAFE System doesn't involve homes levitating above the water per se, it operates on essentially the same premise. A shallow basin is excavated in a coastal area, with an inlet system that connects it to a nearby bay or river that allows water to flow freely in and out as the water levels rise and fall. Then, a series of foundation buoys, about the size of a shipping container, are arranged along the floor of the basin. They're locked together to create a broad, stable platform -- serving as the de facto ground level for construction. Next, the "floating" community is built entirely on top of this foundation, complete with buildings, roads, landscaping, and utilities. In the event of a storm surge or flood, the foundation buoys -- and therefore, the entire community -- rise up with the water, preventing property damage or danger to residents. Pretty brilliant, right? Theoretically, a city could have a bunch of these SAFE set-ups dotting the landscape, creating a network of neighborhoods that are connected along the same plane during dry times, and separated by ravines of flood waters when they individually float up. Not only would this help to flood-proof existing cities and neighborhoods, it could also open up the possibility of developing new communities on low-lying land that is currently considered too risky or unbuildable -- something traditional levees and surge barriers can't realistically accomplish. Whether or not SAFE is adopted and adequately funded by at-risk municipalities remains to be seen, but the future looks bright. Arx Pax is already in talks with FEMA, and has organized a pilot project to test the system out on the low-lying Pacific island nation of Kiribati. Joe McGauley is a senior writer for Thrillist whose house does not float, as far as he knows.